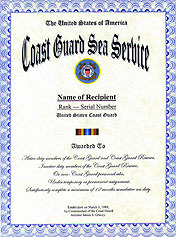 An unaltered photocopy of your DD-214, OR WD AGO 53-55, OR other military issued document clearly displaying your Coast Guard Sea Service Ribbon. The Sea Service Deployment Ribbon was established on May 22, 1980, by Secretary of the Navy Edward Hidalgo and announced in SECNAVINST 1650.35 of January 26, 1981. 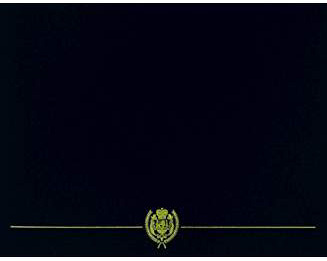 The eligibility commencement date for the Sea Service Deployment Ribbon is August 15, 1974. Awarded to members of the Navy and Marine Corps assigned to U.S. homeported ships, deploying units, or Fleet Marine Force commands for 12 months accumulated sea duty, or for duty with the Fleet Marine Force which includes at least one deployment of 90 consecutive days. The 12 month accumulated sea duty requirement is waived for those personnel who were called to sea duty or deployed for Operations Desert Shield or Desert Storm. For personnel assigned to overseas homeported ships, deploying units, or Fleet Marine Force commands, 12 months accumulated sear duty or duty with the Fleet Marine Force qualifies for award of this ribbon. The Sea Service Deployment Ribbon is worn after the Military Outstanding Volunteer Service Medal and before the Arctic Service Ribbon. Subsequent awards of the Sea Service Deployment Ribbon are denoted by bronze service stars three-sixteenths of an inch in diameter (a silver service star the same size denotes a sixth award).